Wow, how quick the year seems to be flying by and how wonderful to be bathed in glorious sunshine of late! In the church we are now in the long season known as Trinity, but with this brings blessings of hearing about the life, miracles and healings of Jesus and a time to reflect on what it means to be His Disciple (the word disciple literally meaning ‘learner’). I have also begun the wonderful wedding season where we have the privilege of bringing 2 people completely in love into a life-long commitment and witness to this. 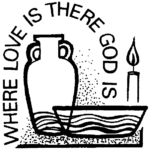 However, this season still sees much sadness in the community’s that I serve with an ongoing time of funeral ministry, reflecting again the power of love. These extremes of life events in ministry perhaps indicate the risk that we take in loving others, but the gift that is experienced also as the lives of others touch ours so deeply. In the world, we hear of sadness across the world continuing to carry on and for many of us we are immersed in the World Cup and painfully watching England play through each match….Come on England…. You can do it!!! Our young people have completed their SAT’s and GCSE and A -Level exams, and for some an extended summer holiday with various proms to look forward to, and everyday life rumbles on as a lot of us look forward to a time of summer holidays to spend time with our families and friends, it is so important that we take time to spend with our loved ones, for none of us knows what tomorrow holds, and the greatest gift we can receive on earth is the gift of time and the gift of one another. During the summer months which has already seen us move through the longest day of the year, remember to take time, for you and your loved ones, and enjoy the gift that is each and every day, and have a wonderful and blessed summer, a time for renewal and refreshment. This entry was posted in Church, News on 1st July 2018 by webmaster.